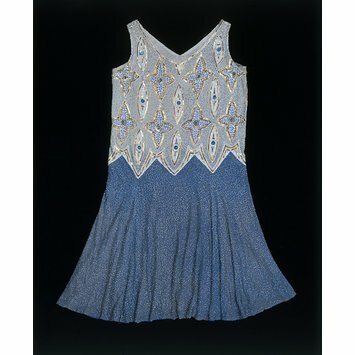 This short and sleeveless dancing dress is made of beaded muslin. The motifs recall ancient Roman mosaics. It was made in 1925, probably in Paris. It has a straight and square bodice, with a deep V-shape opening on the front and back. The bodice and skirt are united by a triangular motif of beading. The skirt flares at waist level. The bodice is beaded with bugle beads in tones of white, gold and blue, recreating ancient mosaic motifs. The skirt is beaded with blue bugle beads. By 1925 evening dresses were designed to reflect the frenzy of the newly discovered charleston and jazz dancing. 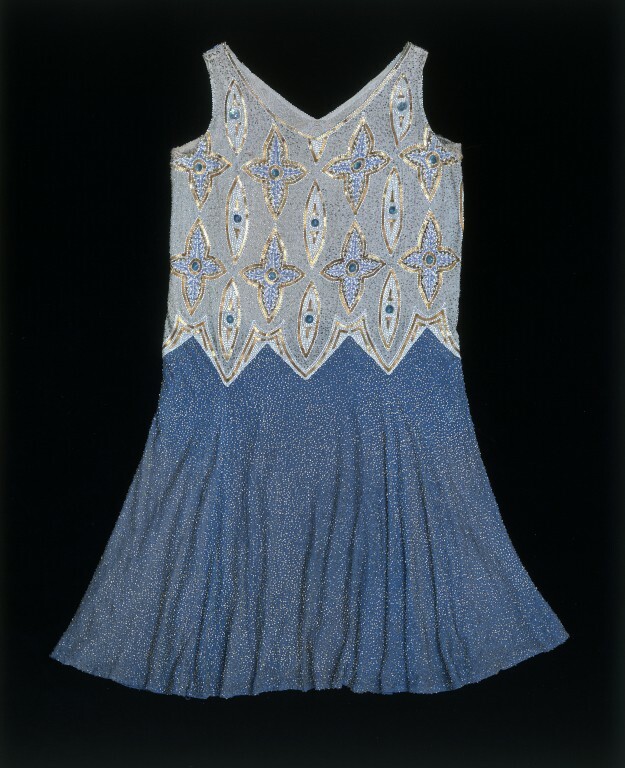 Short and square gowns were often embroidered with sequins, pearls or metallic threads, to achieve the maximum effect of brilliance and to accentuate the movement of the dance. Sleeveless and short dancing dress made of hand-embroidered muslin with beads and sequins. With a straight and square bodice, and deep V-shaped opening on the front and back. The bodice and skirt are reunited by a triangular motif of beading. The skirt flares at waist level, and it is bias-cut. The bodice is beaded with bugle beads in tones of white, gold and blue, recreating ancient mosaic motifs. The skirt is beaded with blue bugle beads. Historical significance: By 1925, evening dresss were designed to reflect the frenzy of the newly discovered charleston and jazz dancing. Short and square gowns were often embroidered with sequins, pearls or metallic threads, to achieve the maximum effect of brilliance and to accentuate the movement of the dance.